SAT Subject Tests could be an important part of your college admissions profile. In this post, we'll cover critical things to know about SAT Subject Tests—like the fact that there is still a penalty for guessing, unlike the regular SAT. We'll also discuss other FAQs from Alaska students, including which colleges require SAT Subject Tests, what makes for a competitive score. In contrast to the SAT Reasoning Test, SAT Subject Tests (formerly called SAT IIs) are hour-long, multiple-choice tests in specific subjects taught in school. SAT Subject Tests are another standardized test that some colleges use to evaluate your application. Some colleges also use SAT Subject Tests as placement tests for various classes. Common SAT Subject Tests include Math (Level 1 and Level 2), Chemistry, Biology (Ecological and Molecular versions), Physics, and English Literature. Do I need to take SAT Subject Tests? Which colleges require them? Many top tier and highly selective schools require or recommend SAT Subject Tests. Even at colleges that do not require SAT Subject Tests in general, certain specialized programs within those colleges (such as pre-med) may require or recommend SAT Subject Tests for admission purposes. In all, about 8.5% of colleges regard SAT Subject Test Scores as holding "considerable" or "moderate" importance in the admissions process, according to NACAC's 2017 "State of College Admission" report. Popular colleges where Alaska students apply that require SAT Subject Tests include CalTech and MIT. Colleges that recommend or “strongly recommend” SAT Subject Tests include or recommend SAT Subject Tests include Brown, Dartmouth, Duke, Emory, Georgetown, Harvard, Princeton, and Yale. Check the admissions website for any college you are considering to see whether it requires SAT Subject Tests. P.S. If a college advises applicants that SAT Subject Tests are "recommended" or "encouraged," it's a good idea to submit them. Colleges that recommend or require SAT Subject Tests often suggest or specify two tests, sometimes three. If you have a choice, take the tests where you’ll score the highest or where you'll demonstrate your strength in the field you are planning to major in. For example, if you are planning to be a pre-med major, it would be appropriate to submit scores from the Math Level 2 test, along with a science test (Biology or Chemistry). However, each college has its own specific requirements; see each college’s admissions website for details. As one specific example, Johns Hopkins prefers that applicants interested in majoring in engineering submit scores from the Math Level 2 SAT Subject Test plus at least one science SAT Subject Test. The most optimal time to take a given SAT Subject Test is near the end of the corresponding high school class since the material will be fresh and you will have recently finished studying for the in-class final exam. For example, the best time to make the Chemistry SAT Subject Test would be near the end of your high school chemistry class. The May and June test dates are a great time to take SAT Subject Tests because they are at the end of the academic year. New for 2017, the College Board is introducing an official SAT test date in August. If you miss the May and June test dates after finishing a class, prepare over the summer and take the corresponding SAT Subject Test in August. SAT Subject Tests are offered on the same dates as the SAT Reasoning Test (except for the March test date). You can take up to 3 SAT Subject Tests on any given test date (but you cannot take any SAT Subject Tests on the date you take the SAT Reasoning Test). See the College Board website for test dates and SAT Subject Test availability. What is a "good" SAT Subject Test score? SAT Subject Tests are scored from 200-800, with 800 being the highest score. Unlike with the SAT Reasoning Test, most colleges do not publish data on the SAT Subject Test scores of their admitted students. That said, a score in the low- to mid-700s is usually quite competitive. While you should probably score approximately at or above these benchmarks to maximize your competitiveness, keep in mind that the 75th percentile is not a minimum requirement for admission to any college. Colleges evaluate applicants holistically, and SAT Subject Test scores are just one factor among many others considered. 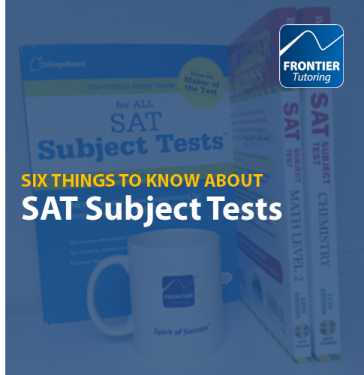 Apart from taking the corresponding high school class(es), it’s important to go into SAT Subject Tests knowing at least a few critical basics about the test. For each SAT Subject Test you’ll take, determine and study the specific subject matter tested, get familiar with the directions, and be aware that some strategy is involved—for example, SAT Subject Tests impose a penalty for guessing incorrectly. You should also plan to take at least one practice test to build pacing skills, as well as gauge your knowledge and readiness. As a critical reminder, SAT Subject Tests feature a penalty for guessing. Unlike the regular SAT, for which a redesigend version was released in March 2016, SAT Subject Tests penalize students by 1/4 raw point for guessing incorrectly. Students earn 1 raw point for answering correctly and zero raw points for skipping a question. If you can confidently eliminate two or more answer choices, it is appropriate to guess. For an extra edge, consider Frontier Tutoring's SAT Subject Test Prep programs, where you’ll get six hours of one-on-one, individualized instruction in preparation for each test. Get free, expert guidance on your testing plans and strategy. Get together with an expert to go over your entire college admissions strategy—including your academic, testing, and extracurricular activity plans. North to My Future, your free, individualized college admissions strategy session, is available at our Anchorage Center.